Is Scotch Ale the Tikka Massala of the beer world? One of the beers I brought back from America was Oskar Blues Brewery Old Chub Scotch Ale. It's an American take on a traditional Scottish beer style brewed with peat smoke dried malt. But here's the kicker, no such style ever existed in Scotland. The Americans made it up. Beer simply wasn't brewed with peated malt in Scotland. The history of Scottish brewing does have some differences with how us English did it, but on the whole they were brewing strong hoppy pale ales to compete with the hoppy Burton Ales (the forerunner of IPA) around the same time as everybody else was, and there is little evidence to suggest they hopped their beers significantly less, or that they ever used peat fire dried malt in brewing beer (only for whiskey). You could argue that Scottish heavies (or Wee Heavies) are similar to what the Americans call Scotch Ale, but again these contain no peated malt. 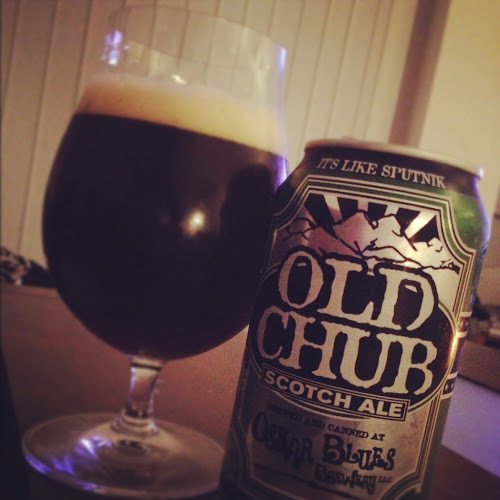 The Old Chub Scotch Ale I tried has all the characteristics the yanks like; heavy and sweet, with a big crystal malt aroma and loads of caramel and toffee. The flavour also has the whiskey tinged peat malt character that's expected, plus digestive biscuit and loads of brown sugar. It's very, 'to style', even if they made it up. Jeff Alworth makes a very strong case on Beervana that though the Scotch Ale style may have been born out of ignorance, it is not without worth, if only as an important part of the American craft beer revolution. A very apt analogy, which half makes me wonder if a day will come when an American brewer will move to Scotland and make 'Scottish' ale, somewhat akin to the British Curry restaurant which opened in Mumbai last year! Usually when people start banging on about the perceived peatiness of a Scottish ale I tell them to go and drink Traquair House Ale and then get back to me. Old Chub's made with Beechwood smoked malt not peat. Also the BJCP guidelines state not to use peat smoked malt so I think it's a bit much to claim ignorance on behalf of our brewing brethren. I think it's also pretty safe to make an argument that there is no real brewing tradition - more that we impose one on the past.